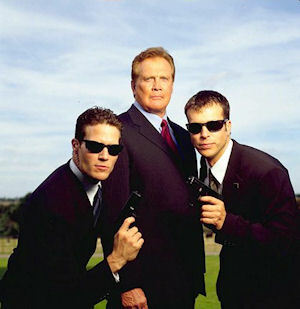 My first impressions of Lee Majors is bizarre and scary. Dressed as Abraham Lincoln (I'll explain later) he wheels round and glares at me when I ask for an interview on the set of a C5 TV film he's shooting just outside London. 'Not now' he grunts. Later, when I meet him at his hotel, 61-year-old Lee is wedged in a couch with a glass of red wine, a cigar and a bowl of nuts. He is spritely and stocky with shoulders that go on for miles. His skin is so tanned and leathery that i have trouble picking him out against the leather of the couch. When his stories begin to roll out, all we're missing is a campfire. There's the one about drinking tequila with John Wayne; breaking his nose five times (once accidentally bu Linda Evans' head); being directed by an unknown Steven Spielberg ('he was weird) and bumping into Jennifer Aniston and Brad Pit the other day in London. 'They're a very nice couple. They're going through the same stuff as me and Farrah (Fawcett). It's difficult when you both have big careers. It puts a strain on things. I hope they stay together.' Lee and the Charlie's Angels' star were the toast of Hollywood during their nine-year marriage but pressures of work drove them apart - he remembers one year when they spent just two weeks together. Rumours of drink and drugs now surround Farrah, the most embarrassing of which was an appearance on David Letterman's US talk show in which she slurred her words. He shifts in his couch and I sense our time is coming to an end. Any regrets? 'Only one. Missing out on the role in Midnight Cowboy that went to John Voight. It hurt me at the time. But I look back and I've spent more hours in front of the camera than he'll ever dream of and made more money than he'll ever dream of.' And with that, he rides off into the sunset. Well, kind of.